It took all of three seconds for the nastiness to ensue. 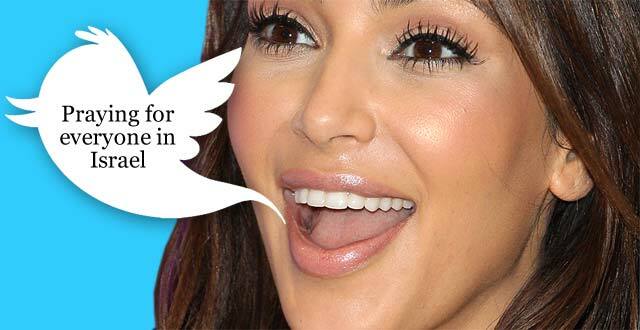 Angry Twitter users called Kim Kardashian out for her comment, and some reports even say Kim got death threats! Kim quickly tweeted again, saying she’d be “praying for everyone in Palestine and across the world.” Well, that’s one way to try and stave off the critics, right? Wrong! The nasty comments continued and things got so bad that Kim finally just gave up and deleted the tweets. By that time, however, the damage was done. Kim Kardashian decided at that point that perhaps an apology was in order. She took to her personal blog to say she was sorry after she “realized that some people were offended and hurt” by her comments. At least her PR people got the spin going quickly, to minimize the damage. Dear Kim: You are not a world leader, capable of helping to broker peace between warring nations. You are a reality TV star. While it’s great that Kim is keeping up with world events, she’s hopefully learned her lesson and will be carefully filtering any future comments.